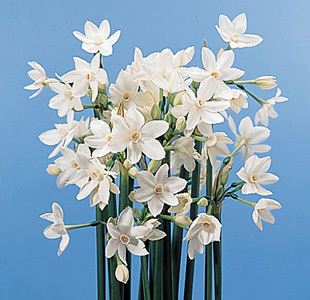 As a member of the Amaryllidaceae (amaryllis family), its common relatives include Agapanthus, snowflake, snowdrop, Nerine, kafir-flower, Amaryllis and Lycoris. Native to the western Mediterranean. It is a monocotyledon produced from bulbs. From 10-20 very fragrant florets are produced on a leafless stem (scape) 15 inches or more in length. Can be stored at 32-33F for up to 10 days or 36-38F for up to 8 days. Dry (preferred) or wet store but keep stems upright to prevent stem bending (geotropism). Van Doorn (1997) demonstrated that when freshly cut daffodils (not paper-whites) are placed in the same tap water with freshly cut roses, the roses wilted very rapidly due to the slime that is exuded from the cut stem ends of the daffodil. However, if a germicide was added to the water such as bleach, this negative effect on roses can be eliminated. It is therefore important to hydrate daffodils in a solution that contains a germicide such as found in flower foods or the bleach example noted above.